The Connecticut Open is going on right now at the Connecticut Tennis Center at Yale in New Haven. While you get your fill of some world-class tennis, you can also fill your belly with some seriously good eats. Little known fact, I used to play tennis back in the day. I practiced by hitting balls against the garage door. I played on my high school tennis team. I watched it on TV. I even went to see my idols play in the US Open and the Pilot Pen (the original tennis tournament in New Haven). Needless to say, I have drifted from the sport in my adult life. However, the opportunity to see pro matches in person so close to home draws out my love for the sport. The thing is, I'm not going to talk tennis here. I'm going to tell you all about the impressive food happening at the tournament. This year, the tournament is featuring some mouthwatering food trucks from the New Haven/Shoreline area. 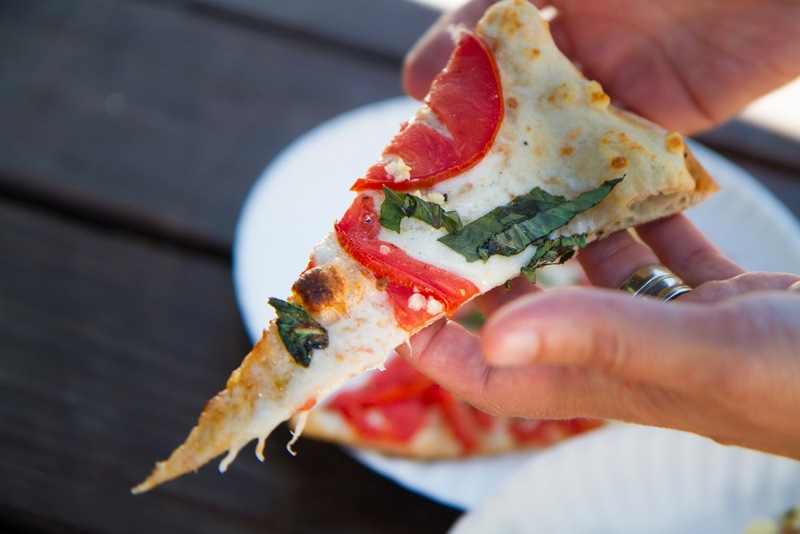 There's The Cheese Truck by Caseus, Tony’s Square Donuts, Naples Wood-Fired Pizza, Crepes Choupette, Valencia Luncheria and Spuds Your Way. 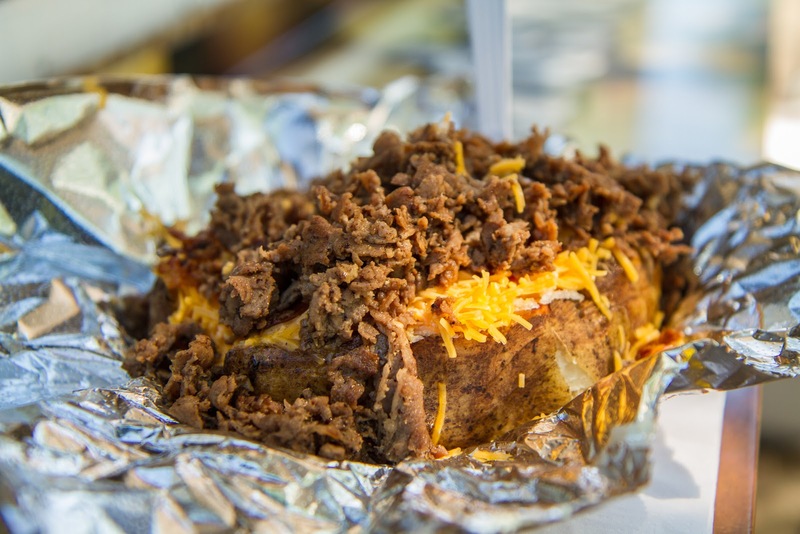 We dove in with a Supreme Baked Potato from Spuds Your Way. It's a big ol' baked potato filled with thinly sliced and minced steak, butter, sour cream, bacon, chives and shredded cheese. This thing had some serious weight to it. 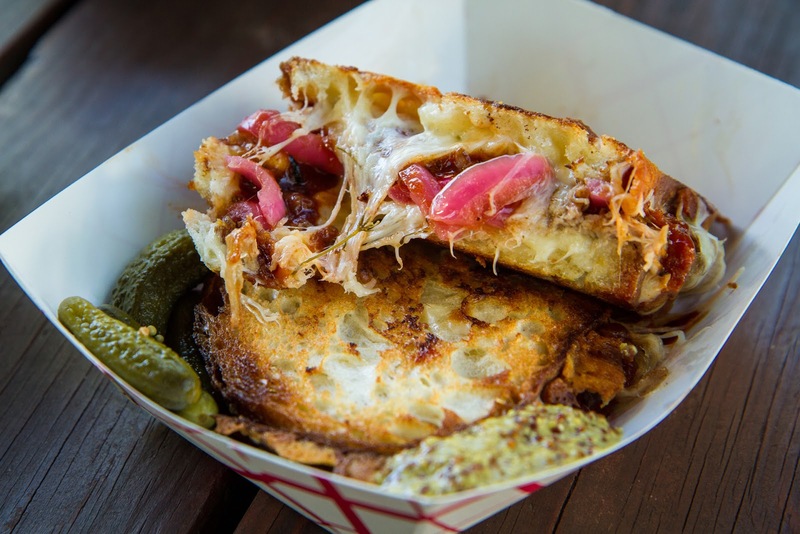 We couldn't resist tasting the Black Hog BBQ Pulled Pork Grilled Cheese from The Cheese Truck by Caseus. Holy Moly. What a sandwich! This is a must try. It was filled with tender pork and onions on a ridiculously crunchy bread with melty, gooey cheese. 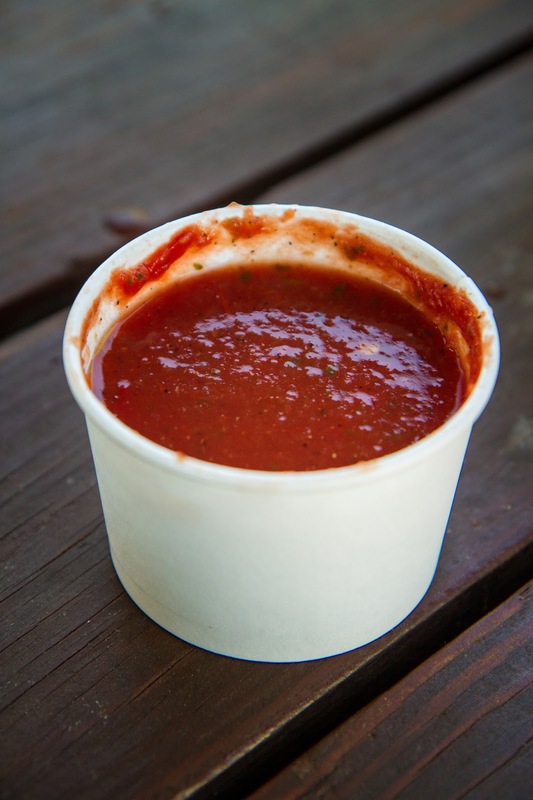 We'd heard that their gazpacho should not be missed, so, of course, we gave it a sample. This incredibly fresh-tasting and refreshing soup is like a fresh tomato sauce that's a little bit chunky with a gentle spicy heat. It's a nice match with one of their crispy melty sandwiches. We weren't going to get pizza, but then, well, pizza! 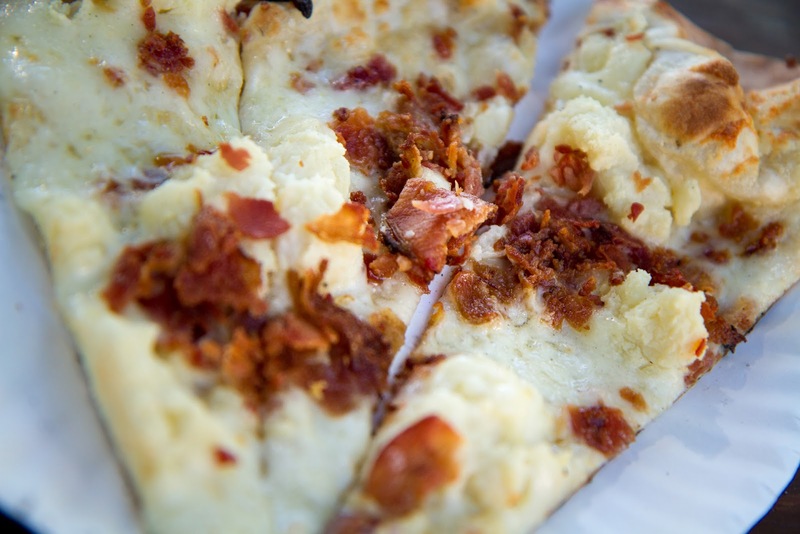 So, from Naples Wood-Fired Pizza, we tried a slice of fresh tomato pie and a slice of mashed potato. The crust was lightly crisp but had a nice bit of chewiness and a touch of char. The tomato was good, but we love carbs with our carbs and the mashed potato won us over. The mashed potatoes were extra buttery and the fact that there was bacon on top did not hurt. It was a really nice slice. 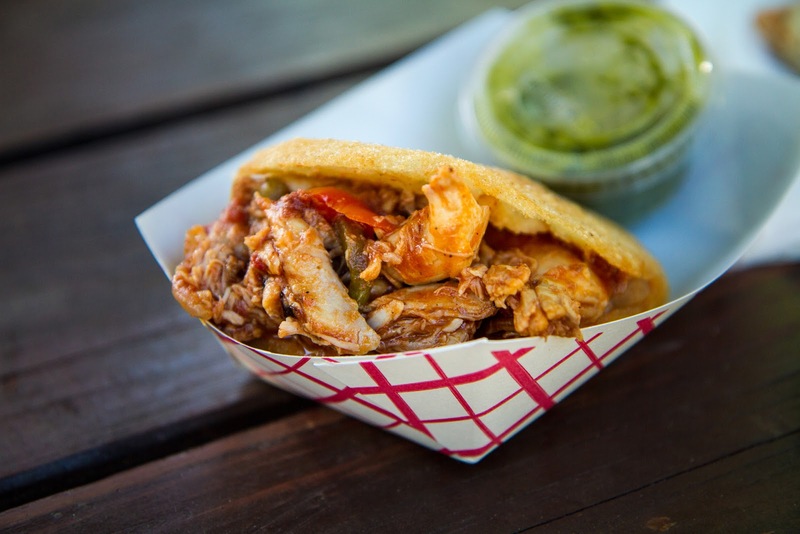 We are already big fans of Valencia Luncheria, but we couldn't resist sharing an arepa. 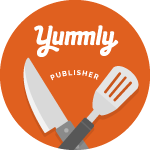 We got ours filled with Chicken Tamarillo, a chicken stew. As expected, it was amazing! The chicken was not only flavorful but also incredibly tender. The stew juices are just enough to soak into the arepa without turning it to mush. And, let's not forget the donuts! 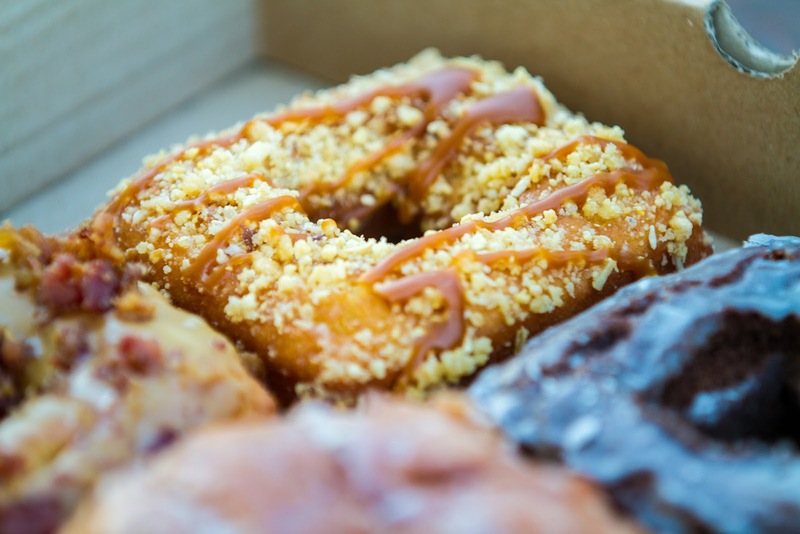 Saveur magazine ranks Tony's Square Donuts as one of the best in the country. We had a hard time deciding on a flavor. We finally landed on the almond-spiked buttercrunch since that was Saveur's pick, and I could not resist trying the Maple Bacon flavor. It's a dense, cake-like donut. We loved the crunchy topping and hint of almond on the buttercrunch. And, for the maple bacon, they do not skimp on the bacon. Nice real chunks of bacon were in every bite. The donut itself isn't sicky-sweet. 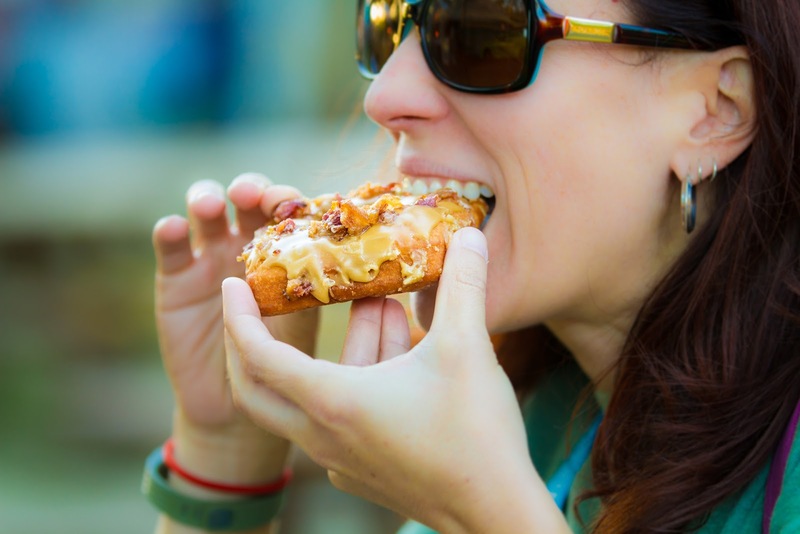 The sugary goodness comes from all in the toppings. 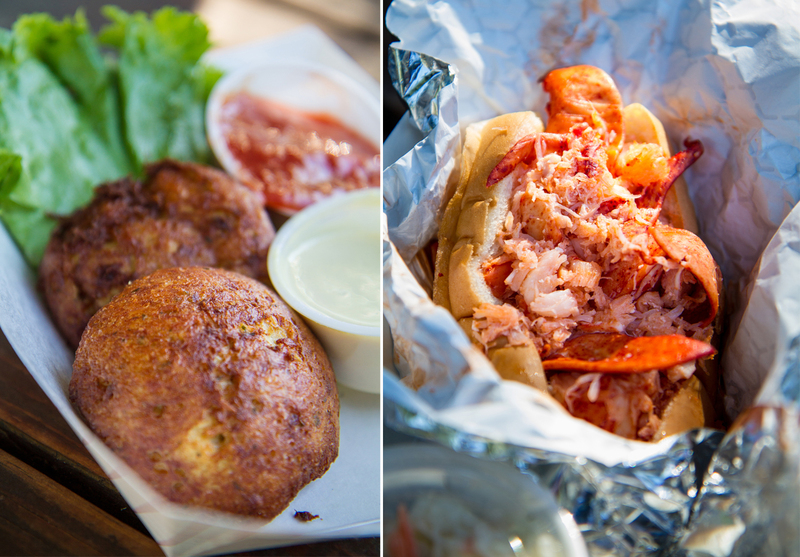 Along with all the food trucks, there is a tent serving all the classic sporting event foods like burgers and hot dogs, as well as a few seafood options like lobster rolls and crab cakes. Oh, and there's the Goose Island Tavern so you can enjoy a nice cold beer or cocktail. The beer selection was pretty good, with a few local brews available too from Stony Creek. Today, Wednesday, August 24 - Geronimo. Chef Arturo Franco Camacho will spice up the week with his delicious and hand-crafted Green Chile Stew. Thursday, August 25 - Claire’s Corner Copia. The iconic vegetarian restaurant across from Yale University and the historic New Haven Green will feature some of “Claire’s Classic’s” including her Lithuanian coffee cake and much-adored carrot cake. Friday, August 26 - Shell + Bones. Chef Franco returns to tap into our summer seafood cravings with his tangy Scallop and Shrimp Cocktail Ceviche. Saturday, August 27 - John Davenport’s. Chef Ruiz brings his contemporary and sustainable local New England fare from the 19th floor of the Omni to the Connecticut open court. It's so great to have a professional tennis tournament right in our backyard. The tournament runs until Saturday, August 27. We spent a delightful afternoon at the tournament getting our fill of tennis and some winning, dare we say, championship eats. Disclaimer: I was not compensated for this post. The food and drink were free of charge. The opinions contained herein are my own and reflect my experience. Your own may differ.